﻿Green split moong Dal is also known as chilka Moong dal or Split green moong beans or green grams. 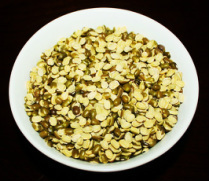 These Green Moong lentils have been split but not skinned and have light yellow color inside. Green moong have a natural and mild aroma and little bland in taste. Some people do not like the taste of moong dal but with the addition of onion, tomato, ginger garlic and cumin seed tadka you can makes this simple dal into a tasty flavorful dish. 1. 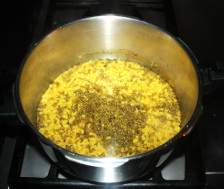 In a pressure cooker add dal and wash, changing water several times until the water appears clear and then soak dal in 4 cups of water for 30 minutes or longer. 2. Once Dal is soaked drain all the water out and wash.
3. Add 4 cups of water, Turmeric powder, salt and 1 teaspoon of oil and mix. pressure cooker to prevent that is a good idea to add little oil. and cook for 3 minutes. Turn the stove off and wait until steam goes down. Different brand of cooker require different time to cook. 7. Open the pressure cooker, turn the stove on to medium heat. then add more water if it is too watery then cook little longer. 2. 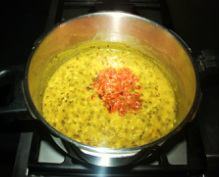 Use pressure cooker for cooking dal otherwise it takes too long to cook dal. 1. In a small pan (tadka pan) add 1 tablespoon oil, cumin seeds and asafetida and fry them for 2 to 3 minutes on medium heat or until cumin seeds become brown. 1. In a small pan (tadka pan) heat 2 tablespoons ghee or melted butter add crushed red chilies or red chili powder and fry them on very low heat for 1 to 2 minutes or until the red chilies fried, turn the heat off. blend with onions. Turn the stove off.